Falsettist: A due alti: Chamber duets by Bononcini, Steffani, Marcello et al. A due alti: Chamber duets by Bononcini, Steffani, Marcello et al. 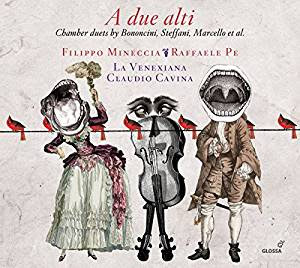 Countertenors Filipo Mineccia and Raffaele Pe form a vocally impressive and well-matched duo for this selection of duetti da camera from the first half of the eighteenth century. Unlike operatic duets where characters are usually in dialogue with each other or duelling from opposing perspectives, these chamber works frequently present musically equal partners, often performing the same text. As such they broadly follow the development of the solo chamber cantata with familiar recitative and aria structures, and highly nuanced texts. [...] Listen especially for the glorious harp playing of Chiara Granata’s prelude to Cristofaro Caresana’s (c.1640-1709) Lamento degli occhi… which also contains some of the best singing on this album. The countertenors are particularly engaging cast as one eyeball each.